Join us for an adventure that's part dinner party and all improvised role-play! Each episode six friends combine forces to weave a tale of fantasy, food, and fun in a home-brewed D&amp;D campaign. There's powerful spells, magic horses, other realms, and enough excitement and laughs for everyone to get seconds. Finally inside the walls of Ravenscrest, the Team takes Margarine to church. Juno spreads the word of the Great Heifer. Flak hears voices. The Team wakes from some pretty intense dreams to find Margarine's new best friend a little hot and bothered. Back on dry land, the Team stops to ask for directions. Flak gets mansion envy. Fletch speaks for the Team once again. Margarine makes a new friend. The Team sets sail for new lands after putting a part of their past to rest at sea. Flak goes fishing. Juno tells a story. Zabbas is proficient in vehicles. Graessle serves up a dish that at least he liked with some hearty ratatouille as the Team confronts Jasson Chon in an unexpected way. Things go dark in the Guild Hall basement. With the Team still at all ends of the Guild Hall, Margarine gets some confounding new information while Juno chooses a strange moment to try to prove he's a changed man. Zabbas makes a new acquaintance, and Fletch and Flak cross paths with an old one. The Team makes the age old mistake of splitting the party as they search the Guild Hall for the mysterious "guest list." Juno tests his range. Zabbas raids a store room. Fletch finds his voice. After a quick step back in time to fill in some story gaps, we're back to the Team's quest to figure out the Guild Hall clue. After a "side quest" resulted in buying the former Brevrisk mansion, Zabbas takes a fall, Juno makes a cool new friend, and Flak opens new doors. Thank Marie Kondo for kicking off the cleaning spree that led to the discovery of this previously lost session. The Team goes on a shopping spree before being interrupted by Juno's Nemesis, Jasson Chon. After two days of studying the journals of Plyntharyn Bylamore, inspiration strikes Fletch from an unexpected place. A stroll down memory lane leads to a new business opportunity and perhaps romance. A magical breakfast recipe from Graessle's mother-in-law fuels the Team through a puzzle filled adventure, and everyone gets some magic items submitted by listeners! Ask Zabbas and Fletch if they had a nice trip, 'cause we see them next fall. Happy New Year, Team! Caithyra and Nils connect some of the dots. The Team inherits a new crib and a new nickname. This shorter episode also includes some of Graessle's answers to listeners' twitter questions! The Team returns to Nights Pass and heads deep into Nights Castle (Margarine has definitely never been there before, no sir) to meet up with Lord Nils and Sir Gregg for a heaping helping of plot. Fletch makes a business deal. Flak is maybe gonna be the one to save you. Now back in the Moonshadow Forest, two paths diverge in the woods, and of course, the Team chooses the nastier looking one. Juno faces some demons. Fletch and Flak play charades. Margarine spits straight fire. It's the season 2 premiere! It's been a long time since the team started this journey, and everyone's grown a lot - including Graessle, who made much, much better pizzas for dinner. Juno gets a little greedy, Zabbas changes his hair, Margarine gets the eye of the tiger, Flak rocks out, and Fletch has your local forecast coming right up after sports. 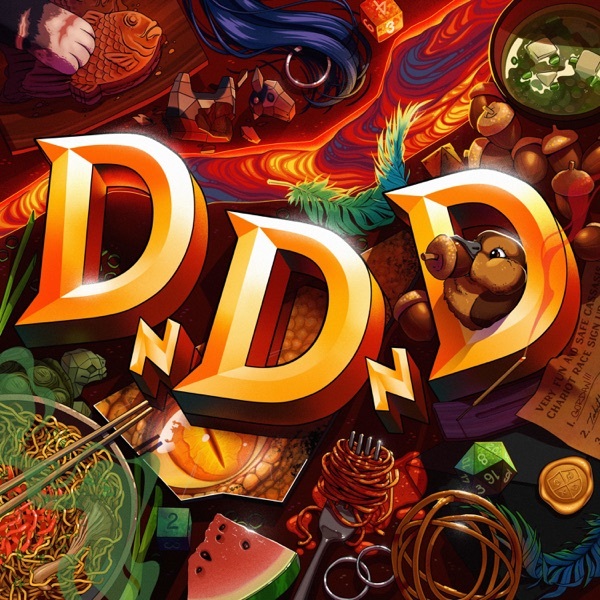 Whether you're catching up to the story so far or here for seconds, get ready for season 2 of DnDnD with this recap of season 1's adventures with Margarine, Fletch, Juno, Flak, and Zabbas. Narration performed by Erin Astin. Recap produced, written, and edited by Joel Arnold. Executive producer James Graessle. Our final one-on-one character episode! James and James sit down at a table for two to talk all things Flak, that charming bard who wants so badly to be more than just a gnome. James applies his brain behavior studies to his character, and we go over all his many, many skills and abilities. Our forth one-on-one character episode! Beth and Graessle sit down at a table for two to talk all things Margarine, whom Beth seems determined to turn into the most lovable killing machine since the end of Terminator 2. This is a deep dive into not only the Campaign Meemaw, but some of Graessle's choices from behind the DM screen. Strap in for our longest episode yet. Our third one-on-one character episode! Mike and Graessle sit down at a table for two to talk all things Fletch Stormtail. We discuss Mike's video game based inspirations for Fletch, how he sees the rest of the Team, and what new abilities he can unlock for season 2! Our first one-on-one character episode! Joel and Graessle sit down at a table for two to talk all things Juno. We check in on your favorite milk boy, discuss possible paths for season 2, and do some character sheet maintenance! It's the end of the beginning. Juno is starting to rub off on Margarine, who tries to get those damn spots of orc blood out, out of her clothes. Later, the real treasure is a new friend. Breakfast is the most important meal of the day when the Team begins the end. Everyone makes a splash on re-entry, and Juno starts to look within. With Juno passed out at the controls, Margarine turns to divine help. Zabbas sets a table for 1. Zabbas, Flak, and Fletch learn there's no eye in Team. Across the Feywild, Margarine and Juno go riding into the Danger Zone. Margarine and Juno find themselves in the first actual dungeon featured on this dungeons and dragons podcast. Meanwhile, Zabbas has some explaining to do when Flak and Fletch wake up in a tight spot. Graessle's vegetarian shepherd's pie may bring together some good good flavors, but the Team is split up in this Feywild adventure. Zabbas, Flak, and Fletch have a magical time in the woods, while Juno and Margarine are mistaken for strangers. Tensions between Flak and Margarine reach a boiling point as the feather cloak comes back to haunt them in more ways than one. The Team is tested in more ways than one as they journey deeper into the hidden cave. Fletch makes a deal. Flak and Margarine feud. Zabbas cooks a chicken. Graessle rolls a 20 with a superlative salmon, and the Team swims upstream towards their goal. Flak enjoys his new coat, Juno stumbles, and Margarine refuses to forget Coyrim. With the Team’s bellies full of vegetarian shepherd’s pie, it's time for Zabbas to put his research to the test. The Team is stuck between a rock and a hard place. The Team sets out in earnest to free the magic beacon at the Grove of the Rock, but are waylaid by some liquor traders from the North. Graessle rolls a 1 on raising dough. The Team splits up to prep for the big quest. Margarine and Coyrim share a moment. Graessle hits a home run with some delicious risotto-stuffed squash. The Team arrives at the Temple of Gaylahmathair where they learn more about Coyrim's quest. Juno and Zabbas are forced to face their past by the mysterious bone dice portal. Will Fletch's luck in battle run out? It's teambuilding day at DnDnD Corp as the Team heads through the mysterious bone dice portal. Fletch makes an imperfect analogy, Margarine dons a sick chapeau, and Flak strikes a chord. The Team fills up on a veggie korma dinner before heading out to join Coyrim Windspear on his quest into the woods. Margarine and Juno evaluate the team. Flak takes some big risks. Dinner and Dungeons and Dragons and Discussion! In this free-wheeling very special episode, the Team gets together around the dinner table for the first time since recording the end of season 1 to talk about the adventure so far. Will this be it?! Will Juno finally find his boys?! The Team's plan to rescue Mort stinks. Cupcakes are served to celebrate Graessle's birthday! But it's the Team who'll receive some gifts in the form of a shady salesman... Later, is Margarine made of jelly? Because she gets the Team out of a jam. It's off to the Oakshield district of Night's Pass as the Team gears up for their quest. Fletch tries to heal some hidden wounds through the power of dance, while Juno's worldview is challenged by a friendly blacksmith. Some delectable butternut squash curry soup warms our heroes as Juno tries to thaw his icy relationship with Lord Nils, who presents the Team with an ultimatum. The Team's flawless streak of investigative victories continues. Flak and Margarine get a botany lesson while Zabbas, Fletch, and Juno hurry to catch up. Well that got out of hand, didn't it? The Team snacks on some delicious apps as they attend the party hosted by the mysterious Zemehm Brevrisk. Flak takes the stage, Zabbas takes the dance floor, and Fletch works on his social anxiety. The Team investigates all around the city to varying degrees of success. Juno finds a new vocation as the Super Mayor rises. Zabbas really wants to get to the party on time. Graessle's wife Erica makes the Team a smokey mac and cheese as Juno survives a cuddle puddle, Zabbas investigates some papers, and everyone goes shopping for new digs. The Team confronts both lizards and frogs as they fight to recover the wagon. Flak picks up a new title, Zabbas makes a friend (sort of), and Juno uses a metaphor. The Team dines on veggie stew served in homemade bread bowls as they venture further into the swamp. Margarine finds a creative solution to a problem, Fletch leads the way, Flak makes some new friends, and Zabbas really wants that robe. The first episode of DnDnD! The party comes together to fight an owlbear as we come together to make our own pizzas. We meet Zabbas, Margerine, Flak, Fletch, and Juno as they arrive in the city of Night's Pass to begin their lives as a team of adventurers.